Chinese military hackers are conducting cyber attacks on the Pentagon’s Missile Defense Agency networks on a daily basis and will soon shift to hacking into networks of missile defense contractors, the admiral in charge of the agency told Congress on Thursday. Vice Adm. James D. Syring, the MDA chief who is in charge of building multi-billion dollar anti-missile defenses, told a House hearing that while his networks are successfully fighting off the cyber attacks, missile defense contractors need to improve their network security. The three-star admiral said the threat of Chinese cyber attacks was equal to North Korean and Iranian missile threats. "I view the cyber threat that I specifically face with MDA and the systems we are fielding on par with any ballistic missile threat that either Iran or North Korea possess," Syring said. Asked by Rep. Mike Rogers (R., Ala.), the chairman of the House Armed Services subcommittee on strategic forces, if he is fighting off cyber attacks from Chinese military hackers, Syring answered: "Yes, sir." He limited his comments and said he would provide details of the cyber threats during a later closed-door session of the subcommittee. "We have taken inordinate steps to protect both our classified and unclassified networks from attack, [with] constant 24/7 monitoring with teams in place plus good material protections of those systems," he said. "My biggest concern remains in our cleared defense contractor base and their protections," Syring added, noting that Chinese efforts to break into missile defense networks are relentless. "They are continuing to try and attack my government networks, every day, classified and unclassified," he said. "But where they’re going next and we’ve gotten examples of this is to my cleared defense contractors with the unclassified controlled technical information." Bolstering the network security of contractors is a high priority across the entire ballistic missile defense system, he said. Foreign states are seeking to penetrate missile defenses and other weapons systems to steal technology and data for use in their own weapons. They also seek to disrupt or destroy the systems in the event of a crisis or conflict. A report by the Defense Science Board warned in 2013 that critical U.S. weapons and other military systems are vulnerable to cyber attack. "The United States cannot be confident that our critical Information Technology (IT) systems will work under attack from a sophisticated and well-resourced opponent utilizing cyber capabilities in combination with all of their military and intelligence capabilities (a ‘full spectrum’ adversary," the report concluded. Syring said in prepared testimony his agency is deploying upgraded command and control systems with better security against cyber attacks. Missile defense personnel also are being trained to prevent cyber intrusions. "We know that malicious cyber actors are constantly attempting to exfiltrate information from U.S Industry," Syring stated. "We will continue to work with the defense industrial base, the FBI, and other partners to identify these issues and raise the costs of this behavior to those responsible, in coordination with national authorities and in accordance with national policy." Syring said a key objective is hardening U.S. missiles defenses for future conflicts, which will likely involve cyber attacks against its networks. "We must build resilient cyber defenses that are capable of detecting and mitigating threats without impeding operations in order to ‘fight through’ the cyber threat," he said. Two exercises simulating cyber attacks on missile defense networks were held last year. Another exercise is set for next month. To prevent cyber attacks through equipment and parts, MDA is tightening the security of its suppliers. "We also have a rigorous cyber and supply chain risk management inspection program to examine everything about our systems, from the truck to supply chain, to the fielded operational ability," Syring said. Chinese agents were detected spying on the U.S. missile defense interceptor base at Fort Greely, Alaska, several years ago, according to defense officials. Barry Pike, executive officer for the U.S. Army’s missiles and space program, said during the House hearing that foreign military threats are growing with the emergence of synchronized air, missile, cyber, and electronic warfare attacks. "Across all Army [air and missile defense] programs, we are improving our resilience and ability to mitigate cyber and electronic warfare attacks," he stated in prepared testimony. Rogers, the subcommittee chairman, said in opening remarks at the hearing that after eight years of President Obama’s administration "our nation’s security is in more jeopardy than any time in recent memory." "North Korea, Iran, Pakistan, Russia, and China are all advancing their ballistic and cruise missile programs, along with weapons of mass destruction programs, to put our military, our allies, and our homeland at risk," Rogers said. "At the same time, President Obama has cut missile defense practically every year he’s been in office," he added. "America’s enemies know an opportunity when they see one; our allies see they are on their own." 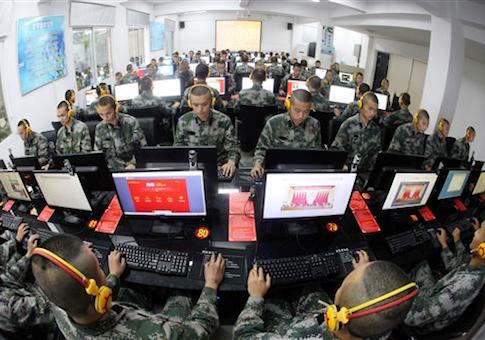 Disclosure of the Chinese hacking against missile defenses comes as Syring and other military leaders revealed the Pentagon is working on its own cyber weapons that could be used to disable or destroy missiles prior to launch. Details about what the Pentagon calls "left-of-launch" measures remain classified but are said to include cyber attacks and other electronic warfare measures against missile launch controls and other information systems. Pre-launch cyber attacks against missiles are designed to bolster other missile defenses, including lasers and anti-missile interceptors, that can attack enemy missiles in the early, middle, and late stages of flight, while decreasing costs. China is developing both missile defenses and anti-satellite missiles that employ similar technologies and are known to be targeting U.S. and allied computer networks to steal technical information useful in developing its weapons. China also has targeted U.S. and foreign suppliers that provide equipment and material used in missile defenses. A briefing in 2014 by Joyce Corell, a senior U.S. counterintelligence official, identified numerous pathways used by foreign states to penetrate the U.S. supply chain. "We have more than enough evidence to know the threat is real and dangerous, but we will inevitably have difficulty predicting targets and assessing impacts," she stated in a briefing slide.